Once you hit the open road in this beautiful car, you’re going to have a tough time keeping a smile off your face. From top to bottom and front to back, this car has been precision-engineered to deliver an incredible driving experience. A wider track and lower center of gravity than the previous Mercedes-Benz CLA give the 2019 model a more athletic feel than ever before. At the rear, a decoupled multi-link axle cuts down on vibration and road noise. A larger diameter stabilizer bar reduces body roll. And the available active adaptive damping system is the icing on the cake, allowing you to adjust between comfort and athleticism to get exactly the ride you’re looking for. Of course, the default is a wonderful balance of both. The 2019 Mercedes-Benz CLA is more intelligent than ever thanks to the MBUX Interior Assistant. This in-car operating system includes advanced Voice Control that allows you to ask surprisingly complex questions. Give it a try here at our Mercedes-Benz dealership near Calabasas, CA. 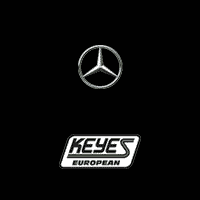 You can take a closer look at the 2019 Mercedes-Benz CLA and other new Mercedes-Benz vehicles now at Keyes European. Once you get behind the wheel, you won’t want to drive anything else.